The most important principle of contract and project work in the oilfields is following safety rules. One important function of real trade unions is to monitor the safety status of workplaces by dispatching health and safety officers to visit workplaces or requesting governmental inspectors to visit workplaces periodically. We have all experienced painful events at workplaces. I started project work in 2003 and worked for Sadr Shimi Shiraz Co. and in that company’s premises a steam boiler exploded & an engineer was fatally injured. In 2004 a pipe fitter called Hadi Davoudi working for Ehdas company (Amini subcontractor) fell from height and received a disabling spinal cord injury. In 2005 in the same company, a steel structure installer, Ali Bagheri, was fatally electrocuted by a 3-phase electric system. 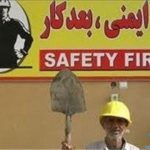 In my other projects including ‘Maskan_Mehr’ home building project of South Khorasan and Mahshahr and Hendijan also number of injuries & fatalities were high as a result of work related accidents. In Ghaenat region of South Khorasan province in North East Iran, my colleague Ahadreza Zare’i was fatally injured as a result of toxic gas inhalation. In phase 12 of South Pars Gas field Development Project, in IND company, a pipe fitter was fatally injured when his clothing was caught by a near-by mini grinder wheel. Just 50 days ago, my close friend Hosein Ashrafi-Tabar fell from height in Bushehr Petrochemical Plant and died. The above list is a small number of accidents that I closely came in touch with and observed in my working life undertaking contract project work. Therefore in the trade union our most constant emphasis should be on safety of personnel. Each worker represents a family. Protecting a worker’s life means creating continued smile for other human beings. The culture of work needs to be developed to avoid giving priority to promotion and pay rather than workers’ health and safety at work. Workers need to be reminded that they work for themselves and their families, and respecting safety means acting in a responsible way as far as our families are concerned.